Meat is mmm mmm good. 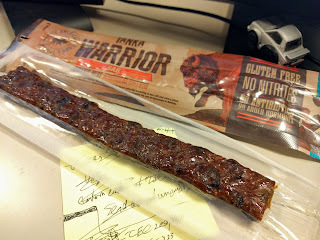 This buffalo beef stick is meaty, duh, and a little sweet and spicy. It's a good flavor combo. The black pepper is not just lip service, it leaves a tingle on your tongue. Big chunks of diced cranberry are scattered throughout the meat bar. Delicious, probably exorbitantly priced. I've tried several of this brand's options and I like them all. Meat snack advantage: no dirty hippie flavors to cover up. Not a hint of flax in this thing. Deja poop score: 9 out of 10. Still looks like an extruded turd--but so do most meat products like this, even if they're not of the dirty hippie variety. Pieces of cranberry only contribute to the visual. There's another variety with sunflower seeds or something in it. You're better off trying not to think about it. Just cram that beef in your mouth and don't ask questions. Delicious. 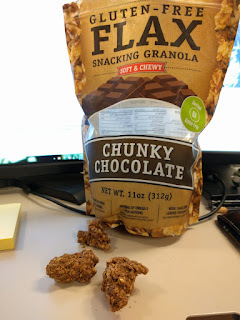 Chocolaty, great bite and texture, no weird dirty hippie flavors lingering afterward or hiding behind the chocolate. I'm actually getting through the whole bag, albeit slowly, because 1/2 a cup has 220 calories. Deja poop score: 9 out of 10. These are identical to the old, dried out dog turds I pick up in my yard on a regular basis.